Read the Comic. Watch the Movie. See the Animation! At the 2010 San Diego Comicon, Alison Pill (who plays Kim Pine in the movie), revealed that her character's past relationship with Scott will be explored in other media. "There will be a little something-something that will air on Adult Swim," she said. Creator Bryan Lee O'Malley elaborated by stating "It's gonna be like a series of short animations The stars of the movie will do the voices for the cartoons." Michael Cera and Alison Pill reprise their roles of Scott Pilgrim and Kim Pine from the movie, whilst Mae Whitman and Jason Schwartzman provide voices for Lisa Miller and Simon Lee respectively, as well as playing two of the Evil Exes in the actual film. 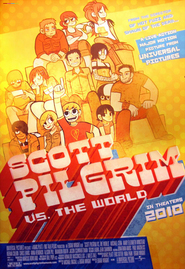 The animated short, entitled Scott Pilgrim vs. the Animation, was produced by Titmouse Inc. and aired on Adult Swim on August 12, 2010, later being released on their website. The first short is based on flashbacks found in Scott Pilgrim vs the World, elaborating on Scott's adventures in high school. 12 Wonder Pets - Save The Beetles! Movies Like Wonder Pets - Save The Beetles!